Ready to Go! is the first of two readers in Stage Three of the Rainbow English Programme. Each reader contains 20 extracts from published children’s literature, 10 factual pieces of writing and 10 poems. The published extracts have been carefully chosen by peer reviewers and cover a wide range of reading genres. Each extract is preceded by oral language pre-reading activities. An excellent, free online oral language programme also accompanies this book. comprehension, vocabulary, word study/phonics, grammar, punctuation and thewriting process. Ready to Go! is accompanied by a ground-breaking Portfolio Book that reinforces the comprehension, vocabulary, word study/phonics, grammar/punctuation covered in the core book. 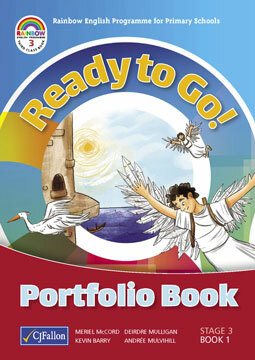 A unique feature of the Portfolio Book is that it covers all the writing genres, as required by the PDST, and is a clear record of the student’s work for the year. An individual pupil profile assessment booklet is also available to monitor progress. The teacher’s notes that accompany Ready to Go! feature a comprehensive week-by-week, month-by-month scheme outlining all elements included in the book.